The Portland, Oregon-based, multi-instrumental twosome are in the business of crafting emotionally energetic songs that are simultaneously futuristic and familiar. With Kevin O’Conner handling the percussions, guitar and piano and Lisa Molinaro playing the viola and synths, the talented duo hover somewhere between the backwoods and the suburbs with their unique blend of indie-folk and hip-hop. The instrumentals are deep, textured and refreshing. It would be criminal to add any vocals to their songs. 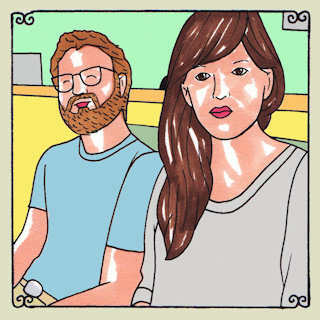 Recently, the band took part in another Daytrotter session that you need to check out. Talkdemonic originally recorded a session in late 2008 that showcased the intimate and appealing nature of their compositions. The most recent session is more light and airy in comparison to their Daytrotter debut. Make sure to check out the playful and provoking “Summer Glass.” Also, shut off the lights and get lost in the spaced out sounds of the aptly titled “Slumber Verses.” At times, it seems as though the Portland pair’s songs are too brief. I would like to see (hear) the band expand their songs. It’s almost as though O’Conner and Molinaro are teasing the listener by clocking some of their tracks just over two minutes. Regardless of the terrible band name—rhetorically, it seems more fitting for a metal band—Talkdemonic is a band worthy of your time. Also, Lisa Molinaro is almost as beautiful as the music she creates. Check out their Daytrotter sessions and tell me what you think. February 28, 2013. Tags: Daytrotter, Kevin O'Conner, Lisa Moliano, Talkdemonic. Daytrotter of the Day. Leave a comment.